Of all the advice on Antimoon, “Do not make mistakes” is by far the most controversial. Hardly a month goes by without an e-mail or forum post from an angered English teacher, letting me know how stupid I am for telling learners to avoid mistakes. Don’t I realize that mistakes are a necessary element of all learning? Haven’t I heard the phrase “learn from your mistakes”? And why am I scaring learners into silence? With this article, I hope to clear up the confusion once and for all. Let me say something obvious first: mistakes are bad. If one had a choice between saying a sentence correctly and saying it with a mistake, nobody in their right mind would choose saying it with a mistake — and no teacher would recommend that. Similarly, no teacher would give a higher grade to a student who made more mistakes than another one. One of the most frequently repeated pieces of business advice is that to succeed in business, you have to try many different things, until one of them finally works. Even huge corporations often release unprofitable products despite spending enormous amounts of money on market research. That’s because it is impossible to tell with 100% certainty whether customers will buy a product until it hits the shelves. These examples teach us that in “unknown” areas like scientific research and marketing, mistakes are truly inevitable. Where no one can predict what will work, people who try and fail have a higher probability of success than those who are doing nothing for fear of failure. Think of Thomas Edison, who had to test over 6,000 unsuitable materials for light bulb filaments until he found one that worked. Are there any other situations where mistakes are necessary? Let’s take learning to swim. Swimming is not an “unknown” area. There is no mystery in it. Everybody can watch slow-motion videos of Michael Phelps and see how it should be done. The problem here is that there is a long way between knowing how to swim and doing it yourself. It takes hours of training to develop the right reflexes: putting your head under water at just the right moment, synchronizing your legs and your arms, breathing in and breathing out, etc. The process involves many mistakes; in fact, as a beginner, almost everything you do is wrong. Are mistakes costly? You bet. Every swimming coach knows that mistakes can easily turn into bad habits, which are difficult to unlearn. When you fail in business, you lose money. These are the costs of mistakes. But you have to accept them, because there is no other way to succeed in business and in swimming. Now let’s take a look at language learning. It’s obvious that learning a language is not an “unknown” area like research or marketing. No one is asking learners to invent anything (indeed, they should not invent their own grammar and vocabulary) — they just need to do things exactly the way the native speakers do it. Language learning is not like learning to swim, either. In swimming, you can remember very well how your coach moves his arms, but still be unable to re-create that motion. Knowing the right way is not enough. You need to train your muscles to react in a certain way, which is a long, error-prone process. First you make a lot of mistakes, then fewer and fewer, until you are error-free. Copying and transforming sentences is an easy job for the brain. By contrast, in languages, knowing the right way is enough. If you can remember and understand a sentence in a foreign language, you can repeat it without any mistakes. If you remember two correct sentences, you can transform and combine them into another correct sentence. There is little room for mistakes. If you are just beginning to write or speak in a foreign language, it will perhaps take you 30 seconds to produce each sentence (you will make a lot of edits or, if you’re speaking, you will stutter and start over). That’s because it can take a long time to recall things, especially if they are not in your “active memory”. But even if you’re slow, your sentence can be error-free or almost error-free as long as you are careful. As noted before, the key to producing correct sentences is remembering correct examples. To build your own sentences in a foreign language, you need thousands of words, hundreds of grammatical structures and dozens of idioms. Furthermore, you must know which words are used in what contexts. For example, end can mean stop (e.g. “We must end the project”), but you cannot say “I have decided to end seeing her” (you must say: “I have decided to stop seeing her”). There are thousands of “exceptions” like that in any language. So, although there is only a short way between theory and practice, the theory is huge. However — and this is crucial — the theory can be acquired without producing mistakes (by reading and listening). Although following correct examples is not hard, there can be some problems. One is that certain information is difficult to notice. For example, if you don’t read English texts carefully, you may ignore the use of articles (a/the), as they are not necessary to understand the meaning. As a result, information on article usage will be missing from your memory and your correctness will suffer. A smaller problem is related to “unexpected exceptions”. Some usage patterns are so rare that it is very difficult to learn them, even with massive input. For instance, “I’d like to see The Simpsons” is correct if you mean the movie, but wrong if you mean the TV show (in that case, you’re supposed to say “I’d like to watch The Simpsons”). Differences like that are really hard to learn, even if you read a lot. There is one area of language learning where “knowing the right way” does not immediately translate into “doing it the right way”: pronunciation. You can spend hours listening to a native speaker saying a word, and still be unable to repeat it properly. In fact, learning to pronounce the sounds of a new language is very much like learning to swim — your brain and your muscles have to get used to new movements. The process takes time and involves many mistakes. It does not require innovation or creativity. All you need to do is copy other people (native speakers). The gap between “knowing how it should be done” and “doing the right thing” is small. Once you have enough correct examples in your memory, it is relatively easy to transform and combine them into your own sentences. You need a lot of correct examples to speak a foreign language, but they can be acquired without mistakes. We have seen that language learning can happen with few mistakes. But why should it? Isn’t speaking and writing with mistakes an effective way to learn a foreign language? After all, “practice makes perfect”, doesn’t it? The learner says a sentence, makes some mistakes, the teacher corrects them, and the learner memorizes the proper way to say the sentence. Next time around, the learner will hopefully make fewer mistakes. 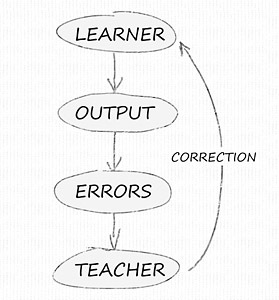 The process is repeated until the learner is error-free. Now, why doesn’t this model work so well? It is obvious that an efficient language learning method must somehow supply all this information to the learner. In other words, the learner needs a huge number of correct examples of the target language. In the feedback-based method, he gets correct examples when the teacher corrects him (and tells him how to say something) and when he listens to his own speech (and his sentences are correct). The problem is that the flow of information is too slow. When you speak in a language you don’t know well, you speak slowly, with many pauses. Before you open your mouth, you have to think what to say. Often, in the middle of the sentence, you start over when you realize you’ve made a mistake. There are also delays due to teacher-student interaction. All this means that the amount of correct language that reaches the learner’s ears is quite small. I did an informal experiment to measure this. First, I read a simplified German book for 15 minutes, using the “pause and think” method (paying attention to grammar and usage). I managed to read 55 sentences (476 words) before the time ran out. Then, I recorded myself talking about the story for 15 minutes. I constructed 21 German sentences (196 words). In terms of the sheer amount of input you get, 4 language classes per week (45 minutes each) would be equivalent to reading a book for 74 minutes. That’s about 10 minutes a day, 7 days a week. A whole school year (9 months) of classes (4 classes per week) provides about the same amount of input as a single 250-page book (84,000 words). Of course, these rough estimates assume classes where students speak all the time — in real classes, a great deal of time is simply wasted; a little time is also spent on pure input (reading a short article in the coursebook, listening to a short recording). The learner can of course “stick to the classroom”, but making any real progress will require more than 8 classes a week. Such intensive courses are quite expensive and impractical for someone who has to go to work, school or college. It seems that a method based on “free” reading and listening will be both cheaper and more flexible. Finally, there is also the problem of finding good teachers. While I have so far assumed that teacher feedback is perfect, the reality is that teachers will ignore many mistakes due to insufficient attention, knowledge or time. Non-native teachers will sometimes object to correct sentences, or their “corrections” may be wrong themselves. My experience in the Polish educational system shows that very few non-native teachers are a reliable source of correct input (not to mention pronunciation, which is a typical Achilles’ heel). Every time you say an incorrect sentence, your brain gets used to it, and it becomes more likely that you will make the same mistake again. We are all familiar with the “fossilized” English learner who always says things like He make, She work, and no amount of corrections seems to help. This is what happens when you’ve been listening to your own version of English grammar for a long time. 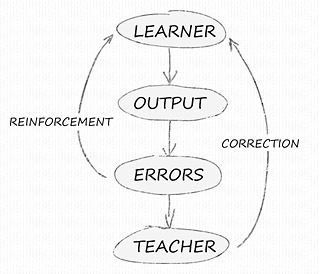 Feedback-based learning: more accurate model. When the teacher corrects you and you try to remember that a given phrase is wrong (this correction will not always occur). Whenever you say an incorrect sentence. The second effect (reinforcement) is probably weaker than the first one (correction), but it further slows down learning methods that are based on speaking. If a learner spends most of his time listening to bad grammar (produced by himself and other students), and he gets little other input, one cannot expect good results. Language learning does not have to be based on speaking, mistakes, and repeated correction. Indeed, if your goal is good English — that is, if you want to be able to speak and write in English with few mistakes and understand English-language television — the feedback-based method is the wrong way to do it. It builds your knowledge very slowly and depends on a good instructor. As a result, only intensive, long-term courses with competent teachers can give satisfactory results, but these are very expensive and very impractical. The alternative — input-based learning (more specifically, the Antimoon Method) — does not rely on mistakes and corrections. It gives you more information in less time and enables you to build your English whenever you want to, for as long as you want. On the other hand, it requires that you enjoy reading books in English or watching English-language programs, and that you apply the principles of careful reading and writing.